The Helen E. Copeland Gallery (HECG) and the School of Art at Montana State University are pleased to announce the opening of Photogram: Work by Former Faculty and Staff on exhibit Tuesday, February 20 through Thursday, March 1, 2018. 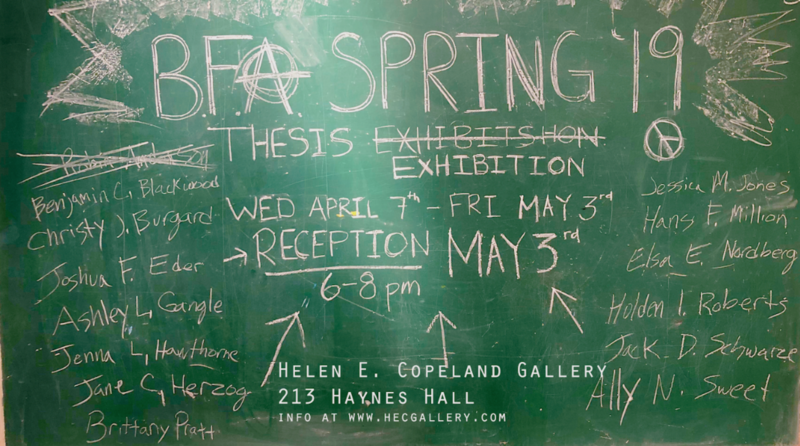 A public reception will be held Thursday, March 1, 2018 from 6:00 – 8:00 pm, in the Helen E. Copeland Gallery, located on the second floor of the School of Art in Haynes Hall. This free event is open to the public. Hors d’oeuvres will be served. In celebration of the 125th anniversary of Montana State University, Photogram: Work by Former Faculty and Staff showcases the work of 22 former members of the School and Art faculty and staff. The exhibit begins with a watercolor by F.E. Marshall, the first head of the Art Department in 1894, and ends with the work of Stephanie Newman, graphic designer, who retired in 2017. Spanning the 125 years the department has educated Montanans in the creative arts, the showcase also includes works by Olga Ross Hannon, Harold Schlotzhauer, Deborah Butterfield, John Buck, Frances Senska, George Conkey, Willem Volkersz, Jesse Albrecht, Kathryn W. Schmidt, Robert Royhl, John Bashor, Rick Pope, Fran Noel, Jessie Wilber, Robert and Gennie DeWeese, Richard Helzer, Mary Anne Kelly, Anne Garner, and a special piece by Peter Voulkos. Though the show is on display for a limited time, it features the enduring art of some of the finest artists Montana has to offer. In addition, there will be a “timeline wall” dedicated to chronicling the rich history of the MSU School of Arts. Posted on the wall with dates of importance, (such as building of the Archie Bray with the help of Rudy Autio, Voulkos, Senska, and Wilber in 1951 and the birth of KGLT radio in 1968) will be old photographs, building plans, exhibition posters, and other ephemera from the past 125 years. Post-it notes will be provided for visitors to contribute by posting events they feel are important to the expansive story of the School of Art in an effort to create a robust depiction of the institution’s history. The exhibition is titled Photogram in hopes of illustrating the importance of teachers in creating the next generation of artists. While searching for a title, Gallery Director and curator Ella Watson wanted to find an art process that personified the idea of taking parts to make a whole as each student adopts pieces of their professors to make their own voice. Looking through the MoMA Glossary, she found this definition of photogram: a photographic print made by placing objects and other elements on photosensitive paper and exposing it to light. Continuing the 125th Celebration of MSU, Photogram will be followed by Jessie Wilber: A Pioneer of Modernism in Montana, a retrospective of the work of Jessie Wilber and guest curated by Michele Corriel. Funding to frame the collection of prints and woodblocks by Wilber, which come from the School of Art Archives, was provided by the Center for Western Lands and Peoples. This exhibit will continue through March 22. Finally, being exhibited concurrently with Photogram and Jessie Wilber for the month of March, is a retrospective of the work of Robert and Gennie DeWeese on display in the Dean’s Gallery on the second floor of Cheever Hall, adjacent to Haynes Hall. For more information on this exhibition, or on the Helen E. Copeland gallery in general, please follow us on Facebook at facebook.com/msuhecg. Previous postVOX POP is NOW!! !